Machine Learning was without question *the* buzzword of 2017. However, it was also overused. The marketing departments of some stakeholders would sometimes dangerously overpromise on its capacity to address specific business problems. Much of 2017 saw the term Artificial Intelligence being presented as an “all-in-one” solution to all of your company’s problems. The truth of the matter is that AI isn’t magic and that there are limitations. In order to move past the hype and into wide adoption, it will be critical for solution providers to define clear use cases so that businesses can quickly identify and understand what each solution can and cannot do. As more and more use cases are defined, there will be a demand for quick and easy implementation. This means going beyond just the Proof of Concept (POC) and innovation teams and quickly and seamlessly into the company as a whole. As a result, interest in functional AI solutions will start coming directly from specific departments, as opposed to driven by the innovation teams. By functional AI, we mean software that has a clear application in business. These functional AI systems, like Natural Language Generation, will grow faster than ever before. Expert systems are another type of AI technology that have become very popular in highly-regulated industries, like finance. The goal of an expert system is to help automate repetitive, time-consuming aspects of a job, freeing up the employee’s time to focus on more creative, non-routine tasks. As we continue on into 2018, the line between these two will be blurred as Machine Learning begins to use aspects of expert systems to speed up development, cut costs, and ensure better accuracy. AI Business Trends #5: The Year That the Black Box Dies! As algorithms become more complex on how they infer relationships from the data, businesses will want more details on how algorithms come up with those conclusions in the first place. This is particularly important now that AI techniques, such as Deep Learning, can infer nonlinear relationships from the data. In 2018, the focus will begin to shift from perfecting the results to understanding the reasoning process. This will require explaining how conclusions are reached and why recommended actions should be taken. Natural Language Generation will be critical for this so as to make that process accessible to business users. As AI continues to become more ingrained in businesses and society, it will be increasingly important to stay up-to-date on the latest developments in AI technology. 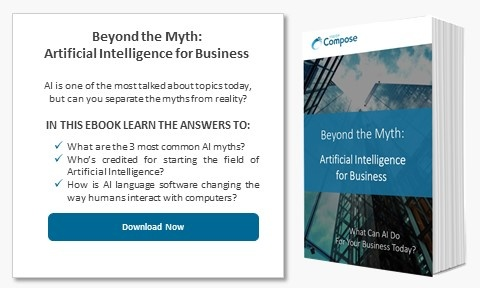 Start off 2018 by downloading our latest eBook to get a better understanding of common AI myths and popular use cases in business today.